So my little seedling is almost 21 weeks along! Now she is the size of a large banana! And we know it’s a she because of our ultrasound about a week ago. Abigail Louise Johnson is her name!! Kyle felt her move around inside me for the first time this morning…it was exciting also! But along with my growing belly, soon I will have a growing garden. Mama helped me do all of it and I am so grateful cause I didn’t know what I was doing. 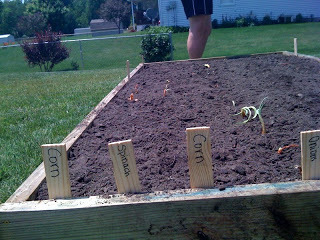 But I just started with one box and we planted corn, spinach, green beans, peas, onions, lettuce, and potatoes. I feel like we got a lot planted in one box. Now I can do a test run this year and see how everything turns out. I want to do more boxes next year and plant more things but I wanted to get acquainted with how it all works first. My task for next year will be making my own baby food for little Abigail. I want her nutrition to be great and cost little like ours. Besides, I think it’ll be fun to cook things and jar it. 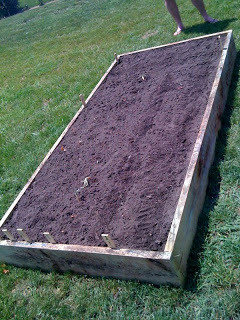 I want to do tomatoes and make my own tomato sauce and salsa. Oh so much fun! Well, these next couple of months will be busy but I’ll try to take pictures and post blogs about it. God is so good and life can be fun! Have my markers of where things are!